“You ready for this Jean?” Ivy asked her subordinate. They were seated in a small communications booth off of the bridge. It had taken nearly another week of semi-automated database queries between the two parties before they felt confident they were ready to start a real conversation. The small chamber featured a desk, a chair, and wallscreens on four walls. Jean sat nervously in the chair while Ivy leaned against the closed door. Ivy took a breath and accessed the room controls through her implant HUD, flipping the recording systems into a high fidelity capture mode. Jean sat up a bit straighter as a red light blinked on in the corner of her own HUD. Jean made a gesture with her hand and then waited patiently for the red light to go off before deflating, her shoulders slumping and head falling softly against the glass-topped desk. “How long until that happens?” Jean asked her as she stood up and stretched her arms and legs. Zephyr hadn’t slept in three days. Her hands shook as she sipped another energy drink. She had swapped her coffee out for them halfway through the second day straight of investigating the loss of the Goose that Laid the Golden Egg. Of the 208 crew members aboard ship, 193 of them had been neatly tied down beneath sheets in one of the vessel’s smaller holds. Their causes of death varied: the majority suffered acute radiation poisoning, while the remainder were a mix of exposure to vacuum, blunt force trauma, or thermal trauma. The other 15 were in hibernation pods. Also dead, all of radiation exposure, but they were well enough preserved for some edge case options to be on the table. Even if the 15 in the hibernation pods were recovered though, the loss of life was still staggering, unbelievable. Every time Zephyr contemplated the number of dead, it made her want to vomit. Doug Farragut told her continuously that it wasn’t her fault. Gyeong Huygens told her to discipline her mind and purge the negative thought patterns from them. Thomas Constantine told her not to think about it. Zephyr instead starting pulling her hair out. The real problem here, the fundamental reason all of this happened, was that she wasn’t yet god, and she really needed to hurry up and fix that so people stopped dying on her. “Zeph, you still with us?” Zephyr’s eyes shifted from the clump of hair still clutched in her fist, to Doug Farragut’s kindly expression halfway down the meeting room table. Doug nodded and she turned her attention back towards Thomas Constantine, the other station commander, who was attempting to brief her and Doug on the status of the investigation. “And your results?” Zephyr asked, a lump in her throat. On the screen, the planet seemed to zoom away as the satellite’s orbit carried it up towards its apoapsis, hundreds of thousands of kilometers above the north pole. Then it slowed to a crawl, passed through the apoapsis and began to fall back towards the world, accelerating as it went. However, about halfway through the descent, something began happening on the planet below. An enormous bulge, like a planet-sized zit, expanded on one side of the world. It swelled rapidly then blew apart into an enormous starburst of gas and debris that reached out beyond the orbits of the moons. As the explosion reached upwards, enormous ripples could be seen propagating through the body of the ring, where the Golden Goose had been orbiting. The entire ring unzipped itself and scattered rocks throughout the lower orbits in a matter of hours, condensed into moments by the playback. To the crew of the Goose that Laid the Golden Egg those few hours would have seemed nearly apocalyptic. Zephyr focused back on the screen. Tiny flashes of light that must have been inter-bolide collisions flickered like distant lightning in the world’s lower orbits, while the surface of the world boiled and churned, with storms rising practically out the top of the atmosphere on impossibly strong updrafts. And then the vast and slow motion explosion began to dissipate and fall inwards towards Theta Tauri c. The blast gouged out a hole in the layers of gas that reached all the way down to the liquid metallic hydrogen core of the world. Sitting in the center of this vast cavity was what appeared to be a black spike of enormous proportions. It was larger than most rocky planets in diameter at the top, and the point reached down to the glowing core of the gas giant. The satellite was still falling, its orbit would bring it swinging in close to the world at high speed, where it would whip through its periapsis before zooming back outwards towards the major leg of its highly elliptical orbit. As it drew closer and closer, rocks could sometimes be seen flashing across the scene in an instant, and then somewhere near the equator, the image finally cut out, and the screen went black with a flash of static. Zephyr took a long moment to process the video before she spoke. Her hand clenched and unclenched as she worked her way through the implications of what she had just seen and one of her eyes twitched maniacally as her brain tried to process this new information. “Zephyr?” Doug asked worriedly. She held up a hand to silence him and met eyes with Tom. “This is the most visually striking to watch, but you can see most of the events in all of them,” Tom answered. Sol-Human-Jean-Paoloni, [we/I?] Accept your position as Representative of Humanity. [I/we?] Dreaming-Waking-Transcending Represent <i34_2015 Lament for Lost Worlds>. You find us under most [distressing/severe/angry/unpleasant?] circumstances. Your species Represent a significant [untranslated]. Never before has any Species besides [untranslated] Created a form of faster than light [engine/thruster/drive?] without first being Gifted the [mathematical equation for a form exotic matter]. We are very [curious/inquisitive/questioning?] of your faster than light [engine/thruster/drive?]. [Untranslated] [we/I?] [fear/know/think/worry] the Reshapers Will soon Arrive at Sol. [Our/my?] Purpose is to Evacuate as many Species as possible from [the galaxy] before the Reshapers fully consume it. [Our/my?] [intent/belief/desire] is to visit Sol in [untranslated time interval] and evacuate as many humans as possible. The response message was splashed across the wallscreens in the communications room again, and Ivy and Jean once again found themselves there strategizing a response. “Thanks for not capitalizing everything this time Emmy.” Ivy said as she read through the mostly translated response message. “You should thank Cale for that, he’s the one that adjusted my translation algorithms.” The computer responded. “If the Reshapers show up not too long after and eat the solar system anyway, then that doesn’t really make a difference though, does it?” Jean asked. “Show us…?” Ivy stumbled, she knew the phrase Jean had used, but most of the time it was in the context of teenage sexual experimentation. “If these aliens were anywhere near our technology level I would say no, don’t give them things that could let them one up us if this is an elaborate lie. But their ship is the size of a planet. They could destroy most of the human race just by camping out somewhere near the sun and destabilizing all of the planetary orbits with their mass. Given that, I think It’s worth asking, and I’d feel awfully smug if we did manage to get that out of them before our backup arrives.” Ivy admitted. “Alright well, let’s do this then,” Jean said with a clap of her hands, sitting down in the room’s single chair. She waited for Ivy to activate the recording mode before she began speaking. The light went out, and Jean once more deflated as she let out a long breath. “Well, we’ve done it.” Dianica Botheys said with a tired sigh. She had been junior mining foreman, acting as the lead foreman temporarily while Owen McGregor was on leave at Pioneer Station. The last few weeks though, had seen her world utterly upended. The planet had exploded around them. They’d tried to escape the blast, but the ring they were inside had ripped itself apart. Asteroid strikes tore dozens of holes in the hull, and nearly half the crew was killed in this opening salvo. Their fission reactor had been ruptured, and they’d failed to fully break orbit, instead merely casting themselves into a many week long suborbital trajectory. Desperation had ruled the day, as the captain sent out EVA workers to try and repair the damaged reactor and assemble the alcubierre ring so they could warp out before their ship fell back into the soup. That was four weeks ago. Over those four weeks, hundreds more had died. Radiation poisoning claimed many, micrometeor strikes killed EVA workers, unexpected depressurizations killed more, explosions caused by damaged components killed still more, and by the time the alcubierre ring had been constructed and the Goose that Laid the Golden Egg had passed through its apoapsis, she was the most senior surviving member of the crew. “Almost feels pointless now though, doesn’t it?” Sing Easterly, the one surviving engineer, answered forlornly. “Or, we could try to fire the engines again, push fully out of orbit of the planet, then jettison the reactor and try to survive until help gets here.” That suggestion came from Clancy Lehady one of the few EVA workers who hadn’t been killed while installing the drive or succumbed to radiation poisoning. “Did you miss the part where we all already have a lethal dose of radiation?” Dianica insisted. “There’s enough hibernation pods for all of us. If we put ourselves in hibernation and jettison the reactor, it might buy us enough time for someone to get here with more anti-rads and anti-cancers.” The old EVA worker crossed his arms and evenly met Dianica’s gaze. “We can still use the hibernation pods if we use the drive. A lot of good people died to get that drive installed, I say we make use of it.” Sing answered. “We should vote on it.” Clancy insisted. Clancy harrumphed as Dianica turned back to Sing. Sing nodded and quickly entered the warp parameters into the drive. The reactor began heating up again as a huge power draw was generated by the systems for the first time in weeks. The young woman’s hand hovered over the final execution sequence as the power levels hit 100%. The thai girl smacked the button and the ship lurched violently as they were thrown into the warp tunnel. Jean and Ivy had migrated to the conference room for the next round of communication after being chastised by both Cale and Evangeline for not consulting them first before offering the FTL technology as a trade. All four of them though, were equally flabbergasted when the Ones Who Came Before sent them back the exact technical specifications for their drive as well as detailed instructions on how to build it and even how to build the machines that built it. The translated text sent with the blueprints were displayed once more on the wallscreens. Sol-Human-Jean-Paoloni, [we/I?] 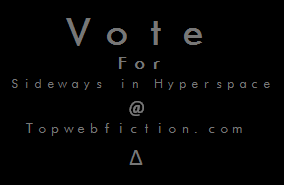 Offer you the Gift of <Hyperspace> that Humanity may take their Place among The Ones Who Followed After. You [cannot/must not/should not?] fight the Reshapers. They will [untranslated] you. Much of your Species may yet survive if we* act quickly. While [we/I?] will respect your desire that [we/I?] not approach your system. [We/I?] [must/should/can?] request you reconsider, for the [untranslated] of Humanity. “Well uh, they showed us theirs all right,” Cale said scratching his head. “You shouldn’t have offered them that deal in the first place Jean.” Evangeline said icily. “Then maybe you should have offered to talk to them instead of having a mental breakdown because we found out about some scary aliens!” Jean wasn’t quite shouting but was very near to it. They looked to Jean, and Ivy flipped the system to record once again. Fractal elves danced through space, twisting and folding in impossible transformations. Spinning many-armed angels of fire collapsed and restructured themselves in a timeless, endless procession of images that seemed to stretch onwards for an eternity. Aliens, faeries, and magical creatures kaleidoscoped into and out of one another, textures emerging and subducting into the larger patterns. The flood of impossible imagery accelerated, shapes blurring past each other, vibrating faster and faster, until the vibrations began to condense into rooms, walls, and people, as Dianica Botheys took her first breath in many weeks. Zephyr Athabasca’s face emerged from the swirling cascade of information as a changed mind and body struggled to understand the world it was seeing. Dianica felt as if she was coming down from a powerful psychoactive experience, the world becoming more and more real by the moment and she realized, slowly, that she was herself, and she was located inside of her body. “I thought I was dead.” She finally croaked out after what must have been a small eternity of her eyes darting around madly, trying to make sense of the world.